Nacha Mendez. Photo credit: Danielle Haynes. While she’s best known as a Latin singer in clubs and restaurants around town and the 2013 winner of the New Mexico Music Award in Latin music, Nacha Mendez is a versatile musician who has almost finished writing her first opera. La Malinche, a Nahua woman from the Mexican Gulf Coast, played a role in the Spanish conquest of the Aztec Empire by acting as an interpreter, advisor, lover and intermediary for the Spanish conquistador Hernán Cortés. Mendez has done a considerable amount of research about this fascinating and often misunderstood woman for her three-act opera, which she expects to complete in 2018. Mendez’s musical journey began during her childhood in the tiny southern New Mexico border town of La Union where she began singing and playing the guitar. Her maternal grandmother, a singer and guitarist, exposed her to traditional ranchera canción. Mendez, born Marghreta Cordero, performs under her grandmother’s name. Listening to FM radio stations brought the worlds of folk, jazz, blues and rock music to Mendez’s front door. As a teen in the 1970s she was listening to musicians including Laura Nyro and Joni Mitchell. “I loved Joni Mitchell because she was an eclectic artist who wrote and sang in many different musical styles,” says Mendez. During high school Mendez performed in border towns near El Paso with her cousins, whose father Jimmy Carl Black had been the drummer for Frank Zappa and the Mothers of Invention. Although she wanted to attend Berklee College of Music in Boston, Mendez ended up going to school closer to home at New Mexico State University, where she studied classical voice and electronic music while majoring in journalism and radio broadcasting. After graduating from college, she headed to New York City where she studied Flamenco guitar with Manuel Granados of the Music Conservatory of Barcelona, Spain while working full-time as at a New York radio station. Radio broadcasting ended up being Mendez’s career for more than two decades. “I wasn’t really getting ahead in radio, and I was tired of doing music after work hours, so I eventually took the plunge and started devoting myself to my music,” she says. By the early 1990s, Mendez was back in New Mexico-jobless, broke and living in Chimayo. 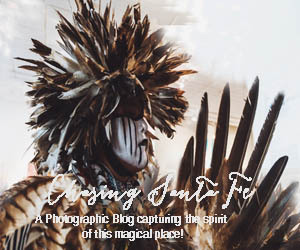 Needing inspiration, she often would visit El Santuario de Chimayo. 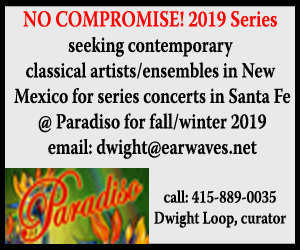 One day, out of the blue, she received a call from a friend who wanted to connect her with Robert Ashley, a New York composer heading to New Mexico to write a lowrider opera. Touring with Robert inspired Mendez to apply for a National Endowment for the Arts grant (which she received) in the mid 1990s to write experimental music for film and dance. For many years, Mendez has performed a wide variety of music-tango, ranchera, bolero, cumbia, salsa and more-five nights a week at local Santa Fe restaurants. Last fall, she landed in the hospital from exhaustion and stress. “It was a sign from the universe that I needed to change my life,” says Mendez, who reduced the number of gigs she was performing. She’s currently playing at La Boca on Sunday nights. During recent months Mendez has resumed writing her opera, a work with electronic and acoustic sounds that she began composing years ago. She also put together “Love Letter to Frida,” an original music and spoken word performance that was presented at the Scottish Rite Center in July.